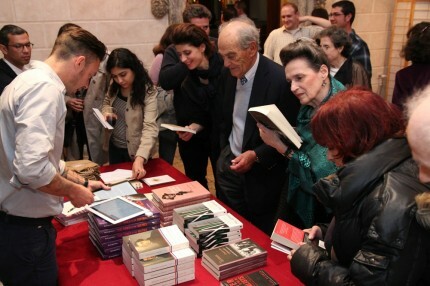 PKPR is working with the Cultural Services of the French Embassy, which provides a platform and resources for cultural exchange between French and American artists, intellectuals, curators, and arts professionals, on the fall 2014 opening of New York City’s only French bookshop, reading room, and cultural space, as well as other special events. Aiming to introduce the very best of contemporary French-language literature to American audiences, Albertine, the acclaimed bookshop of the Cultural Services of the French Embassy, launched the Albertine Prize, an annual $10,000 award honoring the author and the translator of one Francophone novel published in the U.S. The inaugural winner was Bardo or not Bardo by Antoine Volodine. PKPR secured coverage of the new prize in wide range of outlets including the Associated Press, Literary Hub, Publishers Weekly, The Culture Trip, The Millions, and Bookforum. 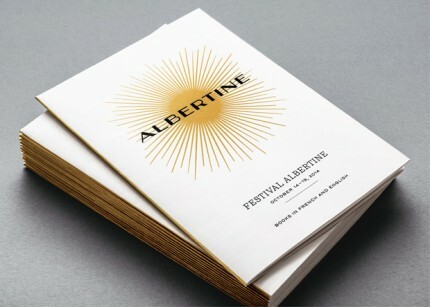 For the second year in a row, PKPR handled publicity for Festival Albertine. The New Yorker’s David Remnick, choreographer Yvonne Rainer, graphic novelist Phoebe Gloeckner (The Diary of a Teenage Girl), author Margo Jefferson (Negroland), and Riad Sattouf, a former contributor to Charlie Hebdo whose new book, The Arab of the Future, was published in the U.S. this month to wide acclaim, were among the American and French-speaking authors and artists that headlined the five day festival. Coverage highlights include a feature in the New York Times’ Weekend Miser (”Lively Debate and Discussion at Festival Albertine”), Time Out New York (”Lit Lovers and Francophiles: Get Excited”), Flavorpill, New York Review of Books, Adweek, and Publishing Perspectives. 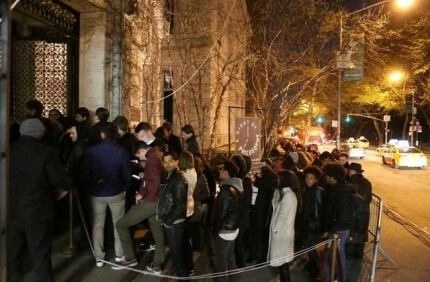 Over 5,000 people waited in line for up to three hours to attend the first-ever Night of Philosophy in New York City last week. PKPR worked closely with reporters at several major outlets to attend and cover most of the 12-hour event overnight event. The result was in depth stories covering the night as it unfolded hour-by-hour. Highlights included a front-page Arts section story in the New York Times (”12 Hours of a Mental Marathon”), a New Yorker Talk of the Town piece, The Wall Street Journal, Gothamist, Brooklyn Rail, and ArtForum. With the help of preview stories in numerous outlets, over 14,000 people have RSVP’d on Facebook to attend the first-ever 12-hour Night of Philosophy in New York City at the Cultural Services of the French Embassy and the Ukrainian Institute. Our favorite headline was in Quartz: The French Embassy is about to host the most French event New York has ever seen. Other preview coverage included: Time Out New York Critics’ Pick, Flavorpill, HyperAllergic, am New York, Art Nerd New York, Untapped Cities, Publishers Weekly, and 6SqFt. 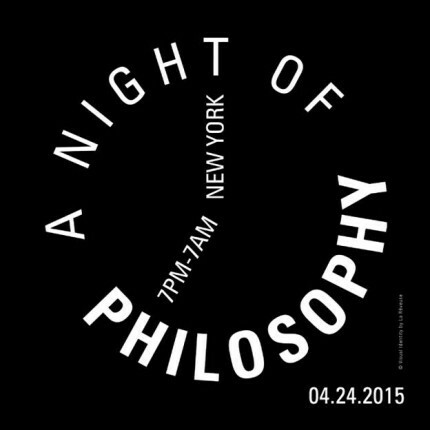 PKPR placed an exclusive with the New York Times (”Ready Thyself for an All-Night Philosophy Jam”) on the announcement of New York City’s first-ever Night of Philosophy on April 24-25. 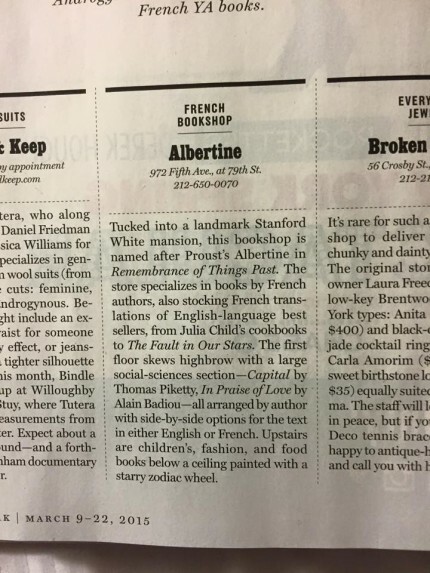 Albertine Books in French and English is singled out for Shopping in New York Magazine’s annual Best of New York issue. Mad Men creator Matthew Weiner, Nobel Prize-winning economist Joseph Stiglitz, filmmaker Olivier Assayas, and, Nobel Prize-winning mathematician John Nash were among the leading French and American thinkers that headlined the first-ever Festival Albertine, as part of the opening festivities for the opening of the French Embassy’s new bookshop and cultural space. 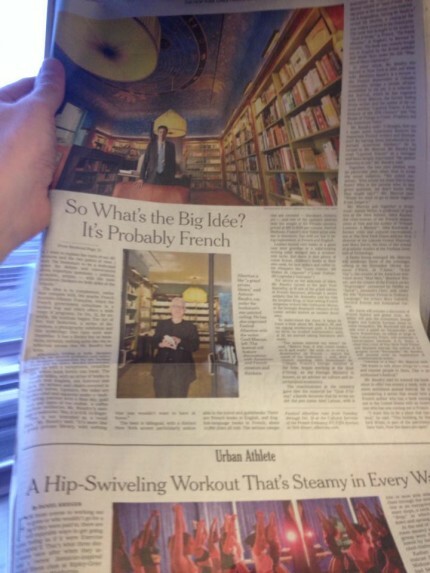 In advance of the official September 27th opening of Albertine, the French Embassy’s new bookshop and reading on New York City’s Museum Mile, PKPR secured a flurry of preview stories in national and local media, led by a wonderful piece by Jennifer Maloney in the Wall Street Journal yesterday. Other highlights include Publishers Weekly, The Paris Review, Time Out New York, New York Magazine, Conde Nast Traveler, Entertainment Weekly, Travel + Leisure, CoolHunting, DuJour, Very Short List, Untapped Cities, and Crain’s New York. That’s the PKPR team at tonight’s private opening event that featured a ribbon cutting by French Foreign Minister Laurent Fabius. 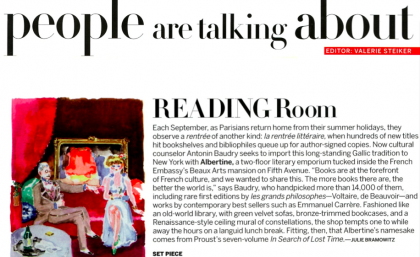 Inside the pages of the iconic September issue of Vogue: Albertine, the French Embassy’s new bookshop and reading room opening in New York City in late September. 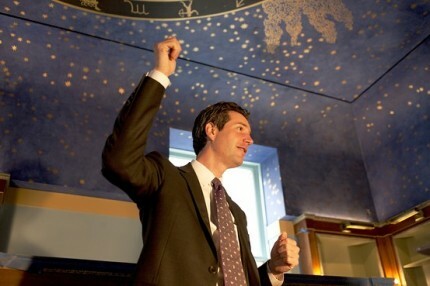 As part of a year-long celebration of the centennial of Marcel Proust’s Swann’s Way, dozens of French and American writers, artists, and Proust fans, including Ira Glass, Mike Birbiglia, Dominique Ansel (creator of the cronut and pictured above), and author Edmund White participated in a weeklong live reading of the classic at venues across city last week. 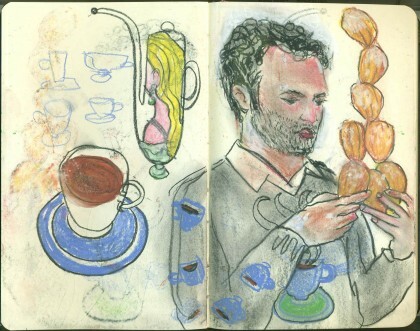 To bring Proust’s world to life, PKPR client Moleskine also curated live drawing events for each reading featuring students and alumni from the MFA Illustration as Visual Essay department at the School of Visual Arts. Coverage highlights included a front page Arts section feature in the New York Times, a pick as one of the five best events of the week by Time Out New York, a behind-the-scenes look at the readings in The New York Observer, and a wonderful photo feature on all of the live sketches in Brain Pickings. 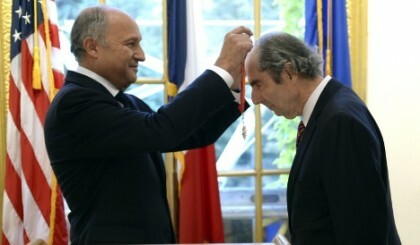 Reflecting the French government’s commitment to French-American intellectual exchange, French Foreign Minister Laurent Fabius last week presented author Philip Roth with the insignia of Commander of the Legion of Honor at a ceremony that culminated with the groundbreaking for a new French bookshop, reading room, and cultural space. Opening in spring 2014, it will be the only bookshop in New York City solely devoted to works in French and in translation, offering more than 14,000 titles in genres ranging from literature, non-fiction, and children’s books to art books and comic books. Coverage of the ceremony and bookshop groundbreaking included The Wall Street Journal, Time, AFP, New York Daily News, and Mediabistro.